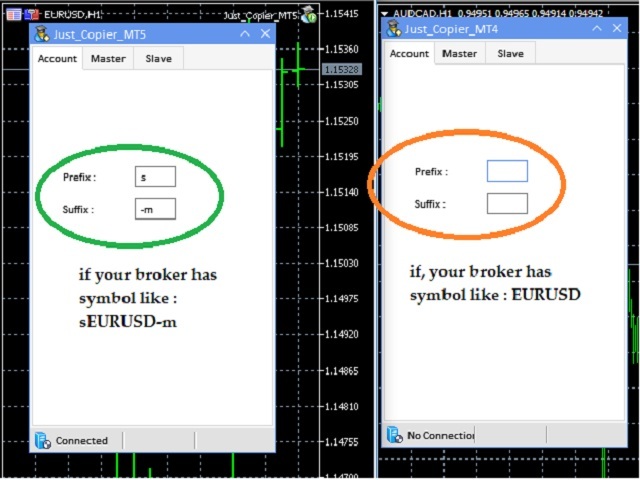 "Just copier" is designed to copy trading without any complicated settings. The copy can be done in one PC. One EA can be set as master (provider) or slave (receiver). The receiver lot can be set to multiple providers lots. Please also check this product at fxina.hostingerapp.com. Any type of copy is available. If you want to copy MT4 -> MT5 or MT5 -> MT4, please purchase "Just copier" for MT4 and "Just copier" for MT5 separately. Just Copier can copy Pending Orders, Stoploss and Takeprofit. In one terminal, "Just Copier" can be functioning as a Master and at the same time also as a Slave. 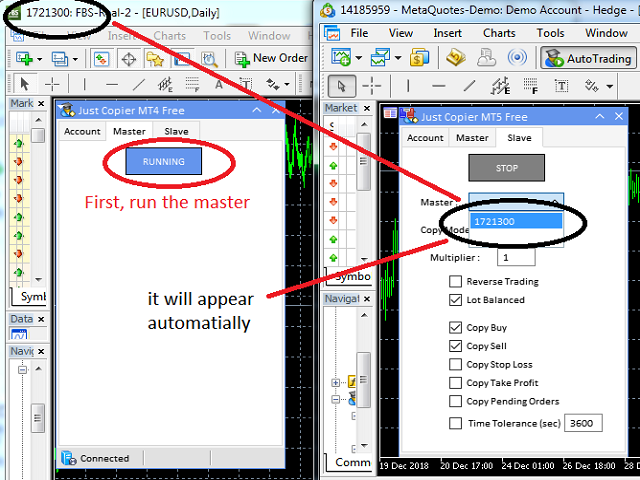 So that Just Copier can be used as a tool to copy trading as a Slave and then immediately send trading signals as a Master. Slave mode can copy several Masters. Lot Multiply - copy of trades with the lot size increased by the specified multiplier. Timer (in seconds) - event generation period of the timer for the copier operation. The greater the period, the less the load on the terminal. He did an execelnte work on the new version 2.15 corrected some bugs like the speed copy and everything else,i was used some renting versions more expensive from others manufacturers, this software is very good and delivers what promises. I highly recommend this version Thank You. Prefix and Suffix features were revised. Fixed some bugs. And it has new feature named "lot balanced", that means the lot of Slave account will be calculated based on Account Balance, Account Equity, Account Leverage and Lot Size of Master account.